Greenhouse gas pollution in the atmosphere is rising, which traps more heat on the planet. The main cause of this excess pollution is carbon dioxide (CO₂), which is emitted whenever people burn fossil fuels (such as coal and petroleum) for energy. It’s us. (Yes, really.) Natural forces such as solar activity, orbital changes, and volcanoes aren’t strong enough to account for the warming we’ve seen in recent decades. Only when we consider the increase in greenhouse gases emissions are we able to explain the observed rise in global temperatures. Check out this interactive graph and see for yourself. The Intergovernmental Panel on Climate Change – made up of thousands of climate scientists and experts from around the world – has concluded that it human activity is “extremely likely” to have been the dominant cause of the observed warming since the 1950s. 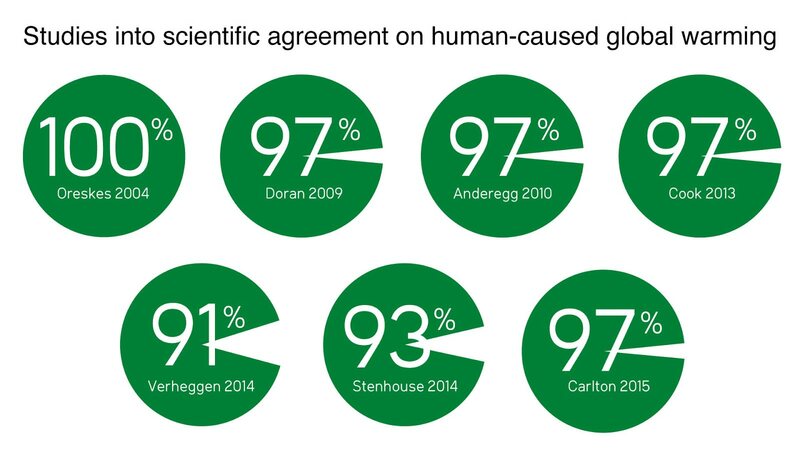 When it comes to whether humans are causing climate change, scientists agree: we are. Yes, but not like this. Previous climate changes usually happened slowly over thousands of years, giving life a chance to adapt. This time, the climate is changing very quickly, over mere decades (since the 1950s atmospheric CO₂ has skyrocketed from 300 ppm to over 400 ppm). This is much faster than normal. Another key difference about the climate change that's happening now is that today, human society exists. As a species, we have never seen this before. This is the first time modern civilization (trillions of dollars’ worth of development and infrastructure, billions of human lives) must face the risks of a rapidly changing climate. Furthermore, unlike previous climate changes, since we’re the ones causing it, we have the power to do something about it. For all these reasons, the climate change we’re seeing today is extraordinary and unprecedented. Why is a warming planet a bad thing? Climate change saddles Americans today and tomorrow with immense costs to our health, property, and security. Rising sea levels threaten to flood major coastal cities. Storms, droughts, and wildfires are growing more severe. Millions of people will be forced to relocate, increasing the chance of conflict. The list goes on and on. The truth is that modern society was not designed to withstand such a rapid change in climate. We're running a large, risky experiment – on ourselves. There is a conservative solution. With a true level playing field, free enterprise can deliver the innovation to solve climate change. Learn more.